Sandy remains a hurricane off the coast of the Southeastern coast of the United States, steadily moving to the northeast parallel to the eastern US coast. Cloud cover associated with Sandy already covers almost the entire East Coast from Florida to Maine, and conditions will only deteriorate from this point as Sandy turns northwest late on Sunday, intensifying even more before striking the region on Monday as a historic superstorm with widespread, damaging, and far reaching impacts. Click below to read the full post for the latest analysis of Sandy and its impact. The image posted above is from the 18z NAM, from the PSU e-Wall. Since yesterday’s update, the model guidance remains in solid agreement of Sandy turning northwest, intensifying into a very intense cyclone and making landfall over the region, although there remains some spread in the model guidance regarding the exact landfall location. As Sandy will be a very large storm, however, the worst of its impact will not be limited to areas near the storm, and will be widespread and far reaching, covering the entire region with heavy rainfall, damaging wind gusts, and a significant coastal storm surge that are likely to result in significant damage and widespread power outages. 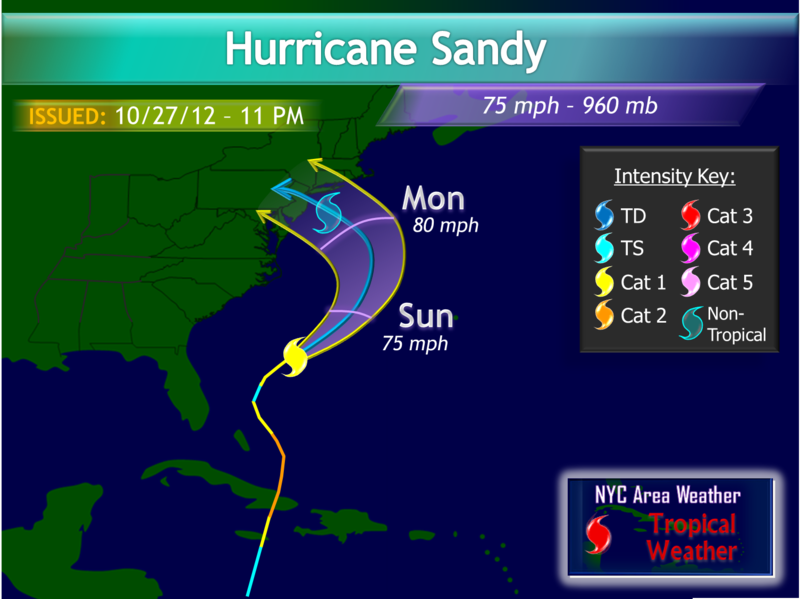 Sandy’s Track: For the short range, Sandy is moving to the northeast, parallel to the Southeast US coast. A trough will approach Sandy from the central US, capturing Sandy as it makes a sharp turn to the north, then the NW/WNW, aiming straight at the northern Mid Atlantic coast. With the model guidance in an agreement regarding the overall scenario for Sandy, the question remaining is exactly where it makes landfall. The model guidance splits regarding this part, with some models making landfall near New York City or Long Island, while other models take a further south route, with a landfall in northern Delaware or southern New Jersey. At this time, I am siding with a landfall near central New Jersey, slightly north of yesterday’s location, although the landfall location is not certain just yet and may still be revised, with a high probability landfall zone between Cape May and Long Island. 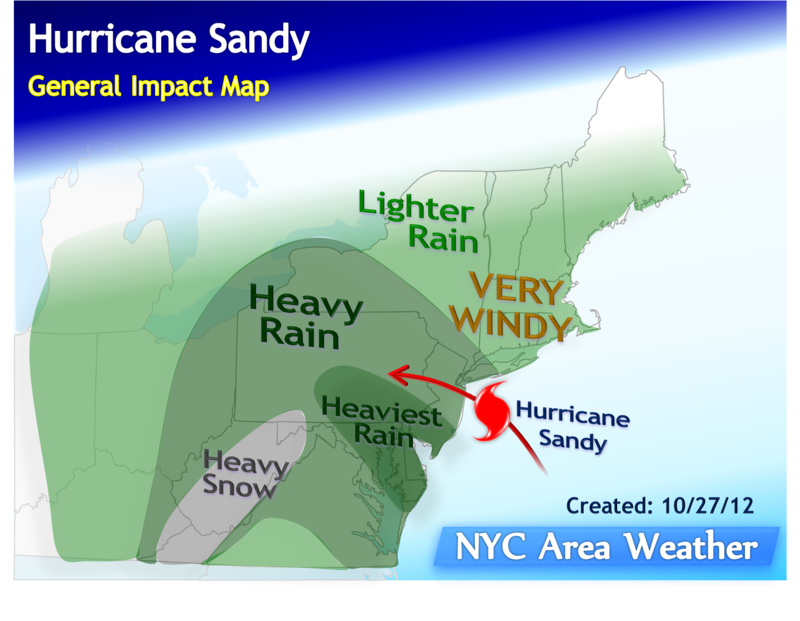 It is very important to remember that Sandy is a very large storm and will have widespread impact. 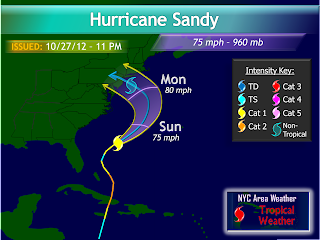 Regardless of the landfall location, there will be significant impact from Sandy across the entire region. Sandy’s Intensity: Sandy briefly weakened to a tropical storm as expected last night, but has slightly restrengthened since then, barely maintaining hurricane intensity with 75 mph sustained winds and a minimum pressure of 961 millibars. Sandy remains disorganized with the strongest convection to its northwest as it continues to struggle with wind shear and dry air. Despite this, Sandy remains a very large tropical cyclone, with tropical storm force winds extending as much as 520 miles outward of the storm center. As of this evening, Sandy has the largest IKE (Integrated Kinetic Energy) of any Atlantic hurricane in recorded history. The IKE also includes a 0.1 to 5.9 scale to measure the “combined storm surge and wave destuctive potential”, with Sandy having received a 5.7 rating this evening; by comparison, Hurricane Ike of 2008 had a rating of 5.4. As Sandy is captured by the trough, it will transition into a hybrid cyclone with tropical and non-tropical characteristics as its minimum pressure drops into the 950 to 960 millibar range, which will be the lowest minimum pressure this region has observed in recorded history. As will be discussed in the next section, even though Sandy is officially forecast to be at tropical storm strength when it reaches the region, that does not mean that it will behave like a regular tropical storm. A minimum pressure of 950-960mb is much lower than that of a typical storm, and it will also be a very large storm, covering the entire region, with the strong winds spread out across the entire region rather than being confined to a small area near the center of the storm. Impact in the Northeast: Sandy will have a significant impact across the Northeast, with widespread strong to damaging wind gusts, heavy rainfall, high elevation snows, and a significant storm surge, combined with Sandy stalling and sitting on top of the region for most of next week, that are set to make Sandy a historic storm in the Northeast. Wind and Storm Surge: The biggest story from Sandy will be its winds and the storm surge. As previously mentioned, Sandy will have a record low minimum pressure, in the 950-960 mb range, which along with its huge size, will spread strong wind gusts across a very large radius, with 40+ mph gusts expected across almost the entire Northeast and Mid Atlantic, from Virginia to Maine, including parts of the Ohio Valley and Great Lakes. The strongest winds are expected to be in the north and eastern sides of Sandy as she comes onshore, generally spread out instead of being confined only to the closest areas to the storm track; in this region, wind gusts of 65 to 85 mph are expected, with some locations potentially seeing gusts above 90 mph especially near the coast. Further inland, more widespread gusts between 40 and 60 mph are expected, with some areas seeing gusts up to or over 70 mph. Assuming Sandy takes the current forecast of a central NJ track, the strongest winds with at least 6+ hours of sustained tropical storm force (40 mph) winds and gusts up to 65-85 mph, possibly higher, are likely to be over the New York City area, extending into southern and eastern New England. Unlike previous hurricanes that affected the region, such as last year’s Irene, Sandy will be coming in from the southeast moving to the northwest, a highly unusual track for a tropical cyclone which exposes a much larger area to its northeastern side containing the strong winds. This track will expose the eastern parts of the area to a persistent east/ENE wind, transitioning to southeast once Sandy makes landfall. A significant storm surge of at least 4-8+ feet is expected from Sandy along coastal areas. Rainfall: Rain will also be a hazard from Sandy, especially to the west and south of the track. Sandy will pull in significant amounts of tropical moisture into the region, with widespread rain totals expected to end up between 4 and 8 inches, locally above 8-10 inches, in that region. To the north and NE of Sandy, less rain is expected, with at least 1 to 4 inches expected, although wind and the storm surge will be bigger risks in these areas. Assuming Sandy tracks through central NJ, the main areas at risk for the heaviest rain are from Delaware through Maryland, northern Virginia, southern NJ, and Pennsylvania. The rain event will be prolonged as Sandy stalls on top of the region for a few days, only leaving around Friday with clearing skies and drying conditions. Snowfall: As Sandy interacts with a cold air mass to its west, snowfall will also be involved. Significant high elevation snows are expected in the mountains of West Virginia, where as much as 1-2 feet of heavy wet snow may be possible. Additionally, as Sandy stalls and weakens, scattered snow showers may spread to other parts of the Mid Atlantic, especially Pennsylvania. 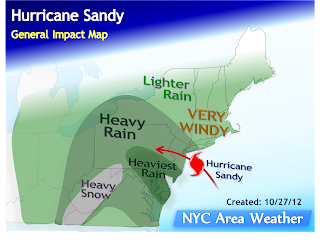 Impacts in the NYC Area: Sandy’s current forecast track through central NJ would place the NYC area along with southern New England in the potential zone for the worst of Sandy’s impact. With the latest trends, Sandy’s timing has been slightly delayed, and showers are expected to begin late on Sunday evening, intensifying into a steady rain by Monday morning. By Monday afternoon and evening, conditions will deteriorate as wind gusts steadily increase, reaching at least the 50-70 mph range by the evening. Very heavy rain will fall west and south of NYC, with lighter rain to the east and north of NYC. The worst of Sandy will take place on Monday evening into the early overnight hours, with at least 6-10 consecutive hours of wind gusts reaching the 60-75 mph range likely. The highest gusts will be towards Long Island and southern Connecticut, where gusts above 85-90 mph may not be out of the question. As Sandy moves inland and begins to weaken, winds will decrease on Tuesday but remain high, gusting into the 35-45 mph range from the southeast, along with occasional showers. Clouds, breezy conditions and showers will stick through at least Thursday. The scenario mentioned above assumes that Sandy makes landfall in central NJ. The exact track is subject to minor revisions, but regardless of the track, the area will see significant impact from Sandy. Please refer to the latest 5-Day Forecast for a more detailed forecast for each part of the tri-state area. Summary: With no major changes to the forecast, Sandy is still on track to end up as a historic event for the region, with widespread and significant damage expected across the region. Widespread power outages and downed trees and power lines are expected across a large part of the Northeast and Mid Atlantic regions, with power outages potentially lasting up to a week, if not more for some areas. For coastal areas, a significant storm surge of 4 to 8 feet, possibly higher, is expected. For western areas, heavy rain of up to 4-8+ inches will result in a widespread flooding potential, and significant wet snowfall is expected in the higher elevations of West Virginia. Preparing for Sandy: Sandy will be a very dangerous and potentially life threatening storm. There is at least 1 day left until Sandy begins to affect the region with deteriorating conditions. Now is the time to finish making preparations. Make sure to gather important supplies, such as food and water supplies, flashlights, batteries, ect. Generators should be prepared for the possibility of days of no power, which will be made worse by the cold temperatures behind the storm, with highs in the 40s to mid 50s and overnight lows in the 30s and 40s. Stay tuned for additional Sandy coverage from NYC Area Weather over the next few days. Updates will be posted during the day on Sunday in the NYC Area Weather Twitter page, and a final forecast discussion will be posted on Sunday evening. Live updates will be posted throughout Monday afternoon and evening unless I lose power, in which case updates will be temporarily suspended.